Hundreds of mourners turned out Wednesday in Riverside, California, for the memorial of Sultan, a police dog killed while attempting to subdue a violent felon. "When I heard this, it felt like I'd lost a peer," Riverside County chief deputy Geoff Raya said at a press conference. "There is very little differentiation between four legs and two legs – they are all members of the Riverside Sheriff's Department." Born in Slovakia, Sultan had been working with the department since September 2013, working in narcotics detection, tracking and apprehension. 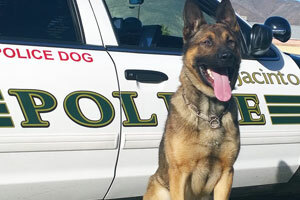 On Jan. 21, the Belgian Malinois-German shepherd mix, along with several deputies from the Hemet Sheriff's station, was called to search for Todd Allen Hodge, 36, who had failed to show up for his arraignment on a weapons charge. Santa Clara gets a Big Thank You!